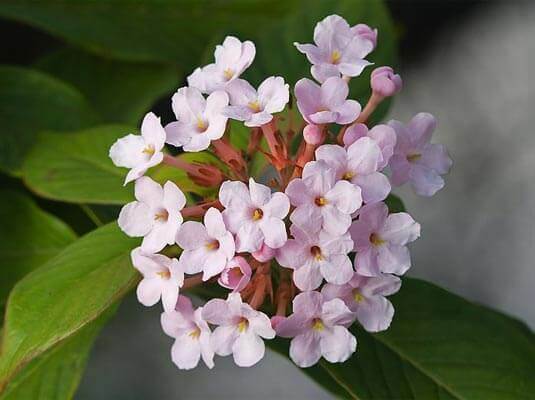 Luculia is a small genus of flowering plants in the family Rubiaceae. It presents as a shrub or small tree. The plant has large leaves from 20-35cm with prominent veins carried in opposite pairs and with a terminal of an umbel or corymb of tubular/open ended white, pink or creamy flowers with 5 spreading petals. The floral terminal may be from 10-20cm, depending on the species. Commonly known as white luculia, this shrub grows to a height of 2m with a spread of 1.5m. This summer flowering variety has the most gorgeous perfume. Plants require full sun to part shade. During the winter, frost turns the leaves of this plant to a red copper colour.